Now that things have slowed down a bit, regular posting should resume. There's been a lot going on in the past few weeks, but I'm going to let most of it pass since I'm late to the party. A strengthening of the IMF was agreed after the Asian crisis in the 1990’s, and the G-7 summit in Cologne in 1999 mandated the Fund to play a strong surveillance role to ensure greater transparency and encourage early adjustment by countries with unsustainable balance-of-payments positions. But, over the last decade, the expectations raised by this mandate have not been met. Some emerging economies did not let their currencies float but, instead, continued to peg them at undervalued exchange rates in order to promote their exports and build up reserves as a form of insurance in case of crisis. Moreover, the IMF has not succeeded in convincing countries to pursue macroeconomic policies consistent with sustainable current-account positions. Nor have advanced economies, particularly the United States, taken IMF advice fully into consideration. The accumulation of large surpluses, especially in emerging Asian economies and oil-exporting countries, enabled the US to finance its current-account deficit. It also lowered long-term interest rates in the US and made monetary conditions there more expansionary. In the context of this testy exchange, "some emerging economies" can only mean China. And I suppose it's not surprising that an ECB official would deflect blame from EU countries despite the fact that Germany, for example, also ran large current account surpluses in the run-up to the crisis. But is it right to criticize the IMF for not succeeding "in convincing countries to pursue macroeconomic policies consistent with sustainable current-account positions"? Not really. Until a crisis hits, the IMF is basically powerless. It can monitor behaviors and help boost transparency, but it has little formal authority to coerce states into allowing their currencies to float, say. How exactly is the IMF supposed to "convince" states to stop acting in their own self-interest? Smaghi doesn't provide an answer, but doesn't see much help coming from multilateralism, arguing that emerging economies that want a larger role in the IMF mostly want to weaken conditionality while increasing access to cheap credit. Gee, it almost sounds like the global economy needs maintenance from a strong state. But Smaghi never proposes that Europe step into the breach. Actually, he never mentions Europe, or even a single European country, at all. Instead, the U.S. and China are somehow expected to voluntarily cede authority to the IMF while eschewing domestic political concerns to bring their current and capital accounts into balance. Well, color me skeptical. Interestingly enough, the quickest, easiest feasible way to moderate imbalances is a higher peg for the yuan against the dollar. But this isn't necessarily something that Europe would like to see. So if the U.S. and China act more prudently, it may come at the expense of the Eurozone. What would Smaghi say then? To whom, then, do I owe a debt of gratitude? To the cardiologist who has kept me alive and ticking for years, and who swiftly and confidently rejected the original diagnosis of nothing worse than pneumonia. To the surgeons, neurologists, anesthesiologists, and the perfusionist, who kept my systems going for many hours under daunting circumstances. To the dozen or so physician assistants, and to nurses and physical therapists and x-ray technicians and a small army of phlebotomists so deft that you hardly know they are drawing your blood, and the people who brought the meals, kept my room clean, did the mountains of laundry generated by such a messy case, wheel-chaired me to x-ray, and so forth. These people came from Uganda, Kenya, Liberia, Haiti, the Philippines, Croatia, Russia, China, Korea, India—and the United States, of course—and I have never seen more impressive mutual respect, as they helped each other out and checked each other's work. But for all their teamwork, this local gang could not have done their jobs without the huge background of contributions from others. I remember with gratitude my late friend and Tufts colleague, physicist Allan Cormack, who shared the Nobel Prize for his invention of the c-t scanner. Allan—you have posthumously saved yet another life, but who's counting? The world is better for the work you did. Thank goodness. Then there is the whole system of medicine, both the science and the technology, without which the best-intentioned efforts of individuals would be roughly useless. So I am grateful to the editorial boards and referees, past and present, of Science, Nature, Journal of the American Medical Association, Lancet, and all the other institutions of science and medicine that keep churning out improvements, detecting and correcting flaws. Indeed. And because the supply of thankfulness is not fixed, it will not depreciate the value of Professor Dennett’s sentiment to add a word of thanks not just for goodness but for greed—the greed that inspired generations of inventors and investors, laborers and capitalists, doctors and nurses, technicians and scientists to envision and perfect such a thing as an artificial aorta, to educate themselves in the healing professions, and to show up for work every day. For the most part, they did it to make a buck. There is more at both links, including a call to arms from Landsburg. But the central point is important, and worth stretching: there is a lot of goodness in the world, and quite a lot of it is motivated by things less noble than altruism: it isn't charity that brought people from all over the world together to save Dennett's life, and the lives of millions of others. So today I give thanks for all the networks and spontaneous orders that allow mutually beneficial relationships to develop between people(s), and I give thanks for institutions that facilitate Pareto-improving interactions. It truly is marvelous, if you stop to think about it. What good is your inner, clandestine productivity if your dean, colleagues, students and even you yourself don’t really know the extent of just how unbelievably productive, busy, stressed, in a rush, and important you really are? Here are some tips on how to communicate this to others at your law school. Tip #1: Walk fast when on campus and explain to colleagues that you cannot go out to lunch because you are busy responding to law review editors’ comments on your manuscript. Tip #2: Remind your colleagues how many students you teach, how many exams you have to grade, how frightfully many hours it will take you to grade them, and how grading exams really cuts down the time you can be available for scholarship, service activities, friends or family. Tip #3: Send an e-mail informing your dean or colleagues that you have been invited to speak at the local Rotary Club or the neighboring town’s PTA meeting. Tip #4: Bring massive amounts of work to talks by outsiders and student events, and make sure to visibly mark on documents — as if editing your own paper or making comments on student work — in full sight of everyone else in the room. Tip #5: Get ticked off and behave badly at faculty meetings. Tip #6: Do not timely answer e-mails from anyone who may be relying on you to show up to an event, help review applications or schedule a meeting, then get huffy when the meeting takes place before you respond to the e-mail. Tip #8: Pretend that you don’t know how to use the copy machine or create a pdf. Tip #9: Refer to anything you write that is longer than 500 words as an “article. Tip #10: Check how many times your and your colleagues’ articles have been downloaded on SSRN. Tip #11: Regularly log on to the Westlaw JLR database and search “FIRST /2 LAST % AU(FIRST /2 LAST)” using your own name. Tip #12: Keep your cell phone on during class and all meetings, and let it ring several times before stepping out to answer it. Posted by Alex Parets at 12:21 AM . The government doesn’t make people go into debt, of course. It just nudges them in that direction. Individuals are able to write off all their mortgage interest, up to a million dollars, and companies can write off all the interest on their debt, but not things like dividend payments. This gives the system what economists call a “debt bias.” It encourages people to make smaller down payments and to borrow more money than they otherwise would, and to tie up more of their wealth in housing than in other investments. Likewise, the system skews the decisions that companies make about how to fund themselves. Companies can raise money by reinvesting profits, raising equity (selling shares), or borrowing. But only when they borrow do they get the benefit of a “tax shield.” Jason Furman, of the National Economic Council, has estimated that tax breaks make corporate debt as much as forty-two per cent cheaper than corporate equity. So it’s not surprising that many companies prefer to pile on the leverage. There are a couple of peculiar things about these tax breaks—which have been around as long as the federal income tax. The first is that they’re unnecessary. Few people, after all, can save enough to buy a home with cash, so home buyers naturally gravitate toward mortgages. And businesses like debt because it offers them tremendous leverage, making it possible to put down a little money and potentially reap a huge gain. Even in the absence of the deductions, then, there would be plenty of borrowing. The second thing about these breaks is that their social benefits are pretty much nonexistent. Advocates of the mortgage-interest deduction, for instance, claim that it increases homeownership rates. But it doesn’t: in countries where mortgage deductions have been eliminated, homeownership rates haven’t dropped. Instead, the deduction simply inflates house prices. The Return of "When Walloons and Flemings Collide"? Posted by Kindred Winecoff at 1:10 AM . My previous post, also motivated by Robeyns, is here. Robeyns' previous writings here. This remains one of my favorite civil controversies. The great irony, of course, is that if this choice destabilizes Belgium it will be destabilizing the seat of the European Union. I assume this decision is strategic, but I don't know enough about the E.U. (or Belgium or Herman Van Rompuy) to really parse out the dynamics. Can readers help? Posted by Kindred Winecoff at 12:52 AM . The annual meeting of the Peace Science Society begins today (Friday) in Chapel Hill at the Franklin Hotel. It's not too late to register, and registration is free for those with institutional memberships (i.e. for those whose universities pay a blanket fee covering all faculty and students). The web site, including list of presentations, is here. There are many presentations of interest to IPE students, conflict students, and others as well. And IPE@UNC will be well-represented. Brad DeLong says "Electricity shortages in a country whose sole export is energy are truly a miraculous thing. It takes a very special government to produce them." “We’re paying for the mistakes of this president and his incompetent managers,” said Aixa López, 39, president of the Committee of Blackout Victims, which has organized protests in several cities. In some cities, protesters have left household appliances on the steps of state electricity companies. Then he went after the country’s ubiquitous love motels and shopping malls, accusing them of waste. “Buy your own generator,” he threatened, “or I’ll cut off your lights.” He similarly laid blame with “oligarchs,” a frequently used insult here for the rich, for overconsumption of water in gardens and swimming pools. Blaming the fat people for an electricity shortage? Even by Chavez's standards, that's pretty crazy. So what are the real reasons? Most significant, though, may be the government’s failure to use its immense natural gas reserves, the second largest in the Western Hemisphere after those of the United States, to fuel existing power plants. So the Velvet Revolution began with a lie. The fall of the Berlin Wall was just a misunderstanding. And while something important did happen on July 4, 1776, nothing at all occurred the day the masses stormed the Bastille. What've we got to do to get a clear, straightforward revolution? I came across the above t-shirt while browsing an online store. 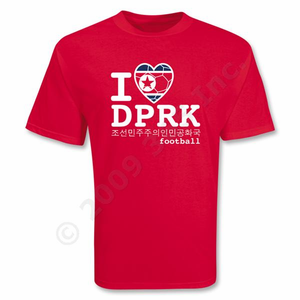 It's a fan t-shirt celebrating the North Korean soccer team. Demand must not have been brisk, because the t-shirt is now on clearance. I guess that's no surprise. Anyway, for those interested in following North Korea's economy (what there is of it), there's a blog for that. It has come to this: Germany will almost certainly have a bigger budget deficit next year than Italy will. Of course inflation has traditionally been a more salient concern in Germany than budget deficits, and despite Frankfurt's influence in the ECB it will likely not be able to jigger the Euro to get out of budget problems. But with debt pressures mounting all over Europe, the coming months might put more pressure on the Euro and ECB than ever before. -- Social scientists are under attack in Iran, by UNC-CH Sociology professor Charles Kurzman. -- Seymour Hersh on nuclear security in Pakistan. -- The rise of East(ern) Germany? -- A&L Daily has all the 1989 links. -- A photoessay on lithium mining in Bolivia, which is used in making the world's batteries. Alex wrote about this a few months back. -- Stiglitz: The global recession is not over. -- Tyler Cowen on the importance of stories. I wonder how this would fit in with the burgeoning diffusion literature? For those in the area, Fareed Zakaria will be speaking to the Triangle Institute for Security Studies tomorrow on Duke's West campus. More info here. Also, UNC will be hosting the annual meeting of the Peace Science Society Nov. 20-22. Some big names and interesting papers, and a lot of overlap with IPE. Info (including a schedule and list of papers) here. Near 23rd Street, just at the Avenida de los Presidentes roundabout, we saw a black car, made in China, pull up with three heavily built strangers. “Yoani, get in the car,” one told me while grabbing me forcefully by the wrist. The other two surrounded Claudia Cadelo, Orlando Luis Pardo Lazo, and a friend who was accompanying us to the march against violence. The ironies of life, it was an evening filled with punches, shouts and obscenities on what should have passed as a day of peace and harmony. The same “aggressors” called for a patrol car which took my other two companions, Orlando and I were condemned to the car with yellow plates, the terrifying world of lawlessness and the impunity of Armageddon. I refused to get into the bright Geely-made car and we demanded they show us identification or a warrant to take us. Of course they didn’t show us any papers to prove the legitimacy of our arrest. The curious crowded around and I shouted, “Help, these men want to kidnap us,” but they stopped those who wanted to intervene with a shout that revealed the whole ideological background of the operation, “Don’t mess with it, these are counterrevolutionaries.” In the face of our verbal resistance they made a phone call and said to someone who must have been the boss, “What do we do? They don’t want to get in the car.” I imagine the answer from the other side was unequivocal, because then came a flurry of punches and pushes, they got me with my head down and tried to push me into the car. I held onto the door… blows to my knuckles… I managed to take a paper one of them had in his pocket and put it in my mouth. Another flurry of punches so I would return the document to them. Before agents released Sanchez, they warned her that her writings had gone too far, the nonprofit said. Freedom of speech is limited in the island nation, where media are controlled by the government. Earlier this year, the blogger was named one of the world's 100 most influential people by Time magazine. The government barred her from traveling to New York in October to receive a journalism award. This should serve as a reminder to how lucky we are to essentially be able to write what we want, when we want without being harassed by government officials, whereas in Cuba, just 90 miles south of the Florida Straits, the same freedoms aren't available. The above picture, from David Beckworth, is shocking. 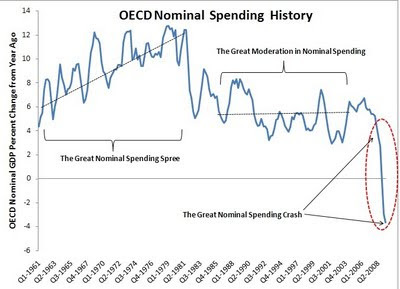 It shows that nominal spending (total demand in an economy) among OECD countries had a jarring drop last year, and that this is the proximate cause of the economic slowdown. (For a short post on why nominal spending matters, see this post). Beckworth is arguing that the Fed screwed up majorly by targeting inflation rather than spending, and is still making the same mistake. If an economy is running at full employment, then any sudden increase or decrease in nominal spending will give rise to changes in real economic activity that are not sustainable. This is because there are numerous rigidities that prevent prices from adjusting instantly. There is simply no way to suddenly jar nominal spending (i.e. create a nominal spending shock) and not have real economic activity move as well. Note that the key here is not to aim for inflation stability, but to aim for nominal spending stability. This is because inflation is merely a symptom of nominal spending shocks. Krugman tries to trump this as he always does, by saying that in a liquidity trap monetary policy cannot get any traction. But it can if it commits to a certain nominal target over time. This is what Scott Sumner has been saying since his first post (and he does not disappoint in his response to Krugman). And as the Free Exchange blog argues, Krugman cannot possibly prove that the central bank is powerless when they haven't even tried to affect inflation expectations. Instead, the Fed has repeatedly sounded hawkish when it comes to inflation. If Bernanke came out tomorrow and said "inflation is soon going to spiral upwards, and there's nothing we can do about it" then present spending would almost certainly jump. Instead, the Fed is committing to holding inflation down when if anything it should be committing to holding it up. Given the Fed's anti-inflationary history, this commitment is viewed as credible. Faced with that reality, spenders are quite rationally holding on to cash, and this has depressed the economy. In other words, Krugman is arguing that something that hasn't been tried cannot succeed. But there are very good reasons for thinking it can: if the Fed were to make a commitment to future nominal spending (or even explicit inflation targets), it would move money in the present. If money moves in the present, then nominal GDP goes up. If nominal GDP goes up, then the economy grows back into full employment. On Nov. 3 the U.N. agency on labor, the International Labor Organization (ILO), released a 15-page report finding that real wages fell in countries around the world, including the U.S. and some other wealthy nations, raising questions about whether workers are sharing in any global economic recovery. The report included data from 35 countries, and found that monthly wages have fallen almost 2 percent in the U.S. since January 2009. The ILO found that inflation-adjusted wage growth fell sharply around the world in 2008 to 1.4 percent, down from 4.3 percent in 2007, and wages continued to fall in a number of countries in 2009. This continuing drop in real wages around the world illustrates the need for trade policies and agreements that protect workers’ rights and prevent a further “race to the bottom” in global wages. So first of all, this means that real global wages actually increased in 2008, though at a slower rate in 2007. And it is not surprising that wages fell during a global recession in 2009. Why? Well, what is a recession? It is a drop in economic output. In other words, the world produced fewer goods and services in the first half in 2009 as it had before. The IMF projects that global GDP for all of 2009 will be negative 1.1%. When output goes down, employment goes down. When employment goes down, so do wages. More importantly, this has nothing to do with a "race to the bottom" in wages. Wages aren't down because states are trying to lure foreign capital by weakening standards; wages are down because economic activity is down, full stop. A "race to the bottom" story would have to show that real wages declined even as output increased. The U.N. report cited by EoT contradicts this story by demonstrating positive wage growth in 2007 and 2008 (years in which output increased), as does this ILO report (pdf). Posted by Kindred Winecoff at 12:22 PM . But one day this bubble will burst, leading to the biggest co-ordinated asset bust ever: if factors lead the dollar to reverse and suddenly appreciate – as was seen in previous reversals, such as the yen-funded carry trade – the leveraged carry trade will have to be suddenly closed as investors cover their dollar shorts. A stampede will occur as closing long leveraged risky asset positions across all asset classes funded by dollar shorts triggers a co-ordinated collapse of all those risky assets – equities, commodities, emerging market asset classes and credit instruments. Here's how this basically breaks down: because U.S. interest rates are so low while the dollar is falling, investors can borrow dollars and sell them for other assets, thus making a tidy profit for doing basically nothing. Roubini's point is that these "other assets" are risky assets across the globe, and the increased demand for them has created a bubble that will necessarily reverse when the dollar stops falling. This assumes that the prices of these risky assets -- equities, commodities, etc. -- are inflated, and there is a lot of room to fall when the dollar rises (and indeed, that the dollar is currently under-valued or close to it). But considering that asset prices are still well below their peaks, it is possible that there is still slack in the system, and the increased demand for these assets reflects some of that slack being tightened. In other words, the return of demand for risky assets reflects sentiment that Roubini describes as "We avoided a near depression and financial sector meltdown with a massive monetary, fiscal stimulus and bank bail-outs. Whether the recovery is V-shaped, as consensus believes, or U-shaped and anaemic as I have argued, asset prices should be moving gradually higher." Roubini sees this rise as precipitously steep rather than gradual. He may be right. But it's not clear that we should freak out just yet. Asset prices dropped much more than they probably should have last fall, and the dollar rose much more than it should have. Part of this is a simple correction. Couple that with the fact that the global economy has stepped back from the precipice, and there are good reasons for the rapid bounce-back in asset markets that we've seen. To be sure, there is a real danger that we'll overshoot again. But Roubini expects "the biggest co-ordinated asset bust ever" yet asset values remain somewhat depressed. And while it's true that the value of the dollar cannot fall to zero, as Roubini says, it is similarly true that all asset value cannot fall to zero. Even if we gave up all the gains made in March, we'd be right back where we were in March and the fall would be less severe than the Sept.-March collapse. Posted by Kindred Winecoff at 11:20 AM . The real scandal of bankers’ pay contributing to the financial crisis is that nobody, literally nobody, has offered a shred of evidence that it did contribute to the crisis. Yet public opinion, the financial press, and the regulators have decided that it did, and drastic new regulatory policies are being constructed on that basis. Moreover, when we consult what evidence is known, it seems that bankers, far from deliberately courting disaster so as to boost their pay, unintentionally took risks that jeopardized their own wealth. Ignorance, not a perverse pay structure, also seems to have been at work at Bear Stearns. William D. Cohan’s "House of Cards" suggests that before losing about $900 million in stock when the bank imploded, Bear Stearns CEO James Cayne had no idea that anything was amiss. In fact, he was obsessed with the construction of a huge new headquarters building that would testify to the permanence of Bear Stearns, formerly the upstart of investment banks. Alex might say "So what? The fact is that the crash happened, and now the government is on the hook for all these bad bets. Therefore the government should limit pay." My response is that it would depend: if the government assumed the contracts made by financial institutions, this should include compensation contracts as well. If the government didn't want to assume those contracts, they should have made that a condition of taking TARP money rather than re-writing the rules after the fact. There's a better case for limiting compensation contracts made after the government investment, but to my knowledge those are not the contracts under discussion. Even more concerning to me is the fact that the internal practices of these firms have now become politicized. How is that a good thing for the firms themselves or the investment that taxpayers have made in them? Indeed, despite the president's assurances, we've already seen fairly drastic meddling in the auto industry which has led them to make poor business decisions for the sake of political expediency. 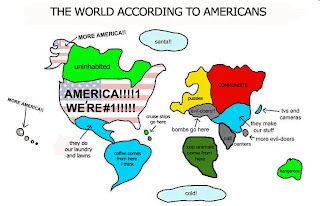 Is that really what we want? Finally, while none of us want to see another financial crisis, it will happen. When it does, we are now incentivizing banks to refuse any government assistance. This could make future crises much worse, and unnecessarily so. The government may also be handicapping itself: if it believes, or behaves as if it believes, that the real cause of the crisis was the incentives created by compensation contracts then it may miss an opportunity to reform the regulatory structure in other ways that could actually have positive effects. It starts here (and with the Bloggingheads above), then here and here, then here, here, here, and ending (for now) here. The debate is centered on Posner's new book, The Perils of Global Legalism, which I have not yet read but which seems to argue that international law is generally not effective. The Folk Theorem in game theory states that any outcome of a repeated game can be sustained as an equilibrium if the minimax condition for both players is satisfied. In plain language, it can be summarised as stating that “if we take strategic considerations into account, there is a game-theoretic rationale for practically anything”. I agree with Henry’s discussion of the limits of rational choice theory and so don’t understand why he thinks I commit the fallacies that he describes. It would be one thing if I said that states’ compliance with treaty X is consistent with rational choice because the folk theorem allows for cooperation, while states’ noncompliance with treaty Y is consistent with rational choice because the folk theorem allows for noncooperation. Or if I said that states comply with treaty W because they care about their reputations for complying with W but that states fail to comply with treaty Z because they don’t care about their reputations for complying with Z. But I never make such arguments, instead ruling out the first type of argument as uninformative and the second as circular. My account of international law is parsimonious, and the usual criticism directed at it is not that it can be manipulated so as to explain anything, but that in fact it fails to explain why certain legal regimes have been successful. So, for example, if in fact states do overcome a collective action problem and collectively sanction states that violate human rights, that is a problem for my theory, not something that I try to explain away by asserting that states have an interest in (say) having a good reputation for enforcing human rights treaties. I'm not going to discuss this exchange more broadly because I don't have the time to do it justice, but this is the blogosphere at its best: two brilliant scholars, from different disciplines, arguing intelligently about real problems and real research. This is the "invisible college" that DeLong refers to. If you are at all interested in international law, human rights, state sovereignty, or high-minded debate, please read these posts. Posted by Kindred Winecoff at 4:05 PM . Krugman and DeLong need to read more carefully. When Ned Phelps wrote "Keynesian economics, which had been nearly forgotten inside the macro field, has found new voices from outside" (bold added) he wasn't talking about them, unless they think that they are outside of macroeconomics. He was talking about non-macroeconomists who don't understand Keynes and misappropriate him to advance political agendas. Which is why he put "Keynesians" in sarcastic scare quotes. No discussion of monetary policy, or liquidity traps, or any of the conditions Krugman laid down. In fact, he applies the argument to Germany in the late-1990s, which was very far away from the zero-bound on monetary policy! Want more? Here is Krugman accusing Keynes' biographer Robert Skidelsky of missing Keynes' best point (and in the process accusing Keynes himself of the same thing). And here is Brad DeLong saying that the Romers believe that "all types of fiscal stimulus are more potent than conventional estimates would lead us to believe" (in this paper, in which the words "liquidity trap" and "zero-bound" are not found, and monetary policy shocks are controlled for), but the period under study contains no occasions of a liquidity trap. I could go on but the point is that many people, including some macroeconomists and many non-macroeconomists, do believe the things that Krugman says nobody believes and many other things besides. Phelps was talking about them, not Krugman or Mankiw. I begin from a different point, from the observations that we Americans alive today are all the recipients of an extraordinary and unmerited gift, an inheritance of institutions, principles, and organizations that is without peer anywhere on the world today and that is of inestimable value. We aren't independent liberal individuals making a social contract in the rational light of Enlightenment Reason. Instead, we are heirs who have received an enormous inheritance from our predecessors. As Burke wrote, we "claim and assert our liberties as an entailed inheritance derived to us from our forefathers, and to be transmitted to our posterity--as an estate specially belonging to the people." It's not a contract, or if it is a contract it is not one just between those alive today. Again, as Burke puts it, if you are to think of a social contract you have to recognize that it is not "a partnership agreement in a trade of pepper and coffee, calico, or tobacco, or some other such low concern, to be taken up for a little temporary interest, and to be dissolved by the fancy of the parties.... It is a partnership in all science; a partnership in all art; a partnership in every virtue and in all perfection. As the ends of such a partnership cannot be obtained in many generations, it becomes a partnership not only between those who are living, but between those who are living, those who are dead, and those who are to be born." The rest of the post is more partisan, so your mileage may vary, but I think all of it is very good. I should once again reiterate that this has major implications for immigration policy, which I consider to be the greatest civil rights issue of our day. 50k met at the corner of Franklin and Columbia tonight. A strong turnout, to be sure. On a somewhat more serious note, Stephen Walt runs down a list of top 10 bogeymen in international politics in recent history. I'd add "terrorism" (defined broadly) to his list, which is a concern but not any sort of existential threat, but otherwise it's strong. And I think that the phobia of immigration is the most concerning and most pressing.